No.F.4 (164) IDOA-Coconut hybridization/20 17- Estt. 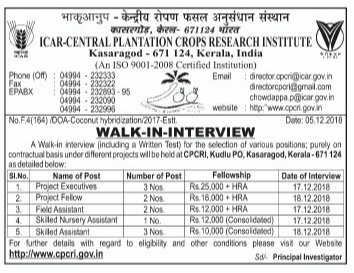 The candidates fulfilling g the above eligibility criteria may attend the walk-in-interview at CPCRI, Kasaragod on the date mentioned above. Candidates should be present at the Institute at 9.00 A.M. on the date of Interview. Late comers shall not be allowed to attend the written test. They should bring with them, their bio-data and original certificates in proof of age, caste, educational qualifications, experience etc. and copy of the experience certificates. Those who do not furnish the Original or Provisional Certificate of the Qualified Examination will not be allowed to appear for the written test! interview.